American Diabetes Association Meeting: Debrief Part One includes the latest research on obesity and insulin resistance as well as the debate about which is the bigger problem - beta cell mass or function, whether total calories or the quality of those calories is more important, summation of several program on a newer focus in diabetes - what's going on in the gut...and more. American Diabetes Association Meeting: Debrief Part Two includes data presented from the 4 year results of the Look AHEAD study in type 2 diabetes, what's happening in the CDC's National Diabetes Prevention Program initiative as well as updates on effective programs to intervene in people with prediabetes, the cost effectiveness data from the Diabetes Prevention Program (study)...and more. 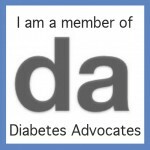 Want to read more of the e-zines I've written for PRESENTdiabetes.com, here's the link: http://presentdiabetes.com/ezines/index.php?section_id=13 to the 2011 ones. Click on the year to read NutriZines from 2009, 2010.